Or maybe they're "old" lows, but oh god. I know bacon has this huge craze going for it right now and there are tons and tons and tons of bacon products, creations, comics, pictures, blah, blah, blah. If that's for you, then hey, check out this list of 101 bacon products. 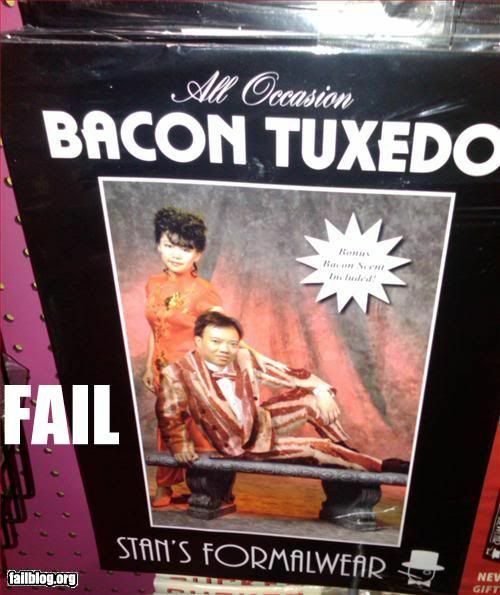 Regardless of if you like bacon or not, or are sick of the bacon craze, you have to admit that the bacon formal wear is pretty freakin' ridiculous. OMG! Do NOT let my husband see this!